PCDJ VJ (Video Jockey) - is the complete and reliable software package for the entertainer that offers the total live performance. DJ, VJ, and KJ all from one comprehensive interface that’s easy enough to use for the beginner, but with all the features the pros need and want. With our ultra-accurate automatic beat-mixing, your songs will always stay in sync, allowing you to focus on the other aspects of your mix. The seamless loop engine will let you pump out remixes on the fly, whether you’re mixing Video, Audio, or even Karaoke files. With frame accurate cueing and no-latency playback, you have the most realistic feel possible. Choose your method of control: Keyboard & Mouse, any MIDI controller, Time-code, or a HID device such as the PCDJ DAC-3. Mix, Scratch, and Remix - with PCDJ VJ all your performance needs are at your fingertips. - Mix Video, Audio, and Karaoke files. - Clip Bank for instant load and playback of visualizations. - BPM calculation engine works with all types of music. - Automatic beat mix tracks. 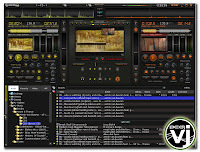 - Beat locked video and audio effects. - Instant search for tracks. - Media-case will automatically sort media types. - Set infinite cue points per track. - Headphone cueing with I/O soundcard support. - Many video effects and transitions to choose from. - Send out the video, karaoke, and scrolling text to a second display. - Live camera feed – mix live video right from the dance floor. - Master tempo and pitch control. - Realistic Scratching with mouse, midi control, time-code, or DAC-3. Audio Formats: CD Playback, MP3, MP3Pro, MP4, M4A, WAV, AIFF, CDA, WMA, ASF, OGG, and iTunes ACC (non-DRM). Video and Karaoke formats: DVD, VOB, DIVX, MPG (1,2,4), AVI, WMV, and Karaoke (CDG – MP3+G).